Since school is back in session all over the country, it’s time for Graphite Confidential to get back to what we do best – telling the stories behind the names and places on old advertising pencils! We had an awesome summer full of adventures, road trips, rock shows, stationery, and of course, pencils and notebooks! In addition to our regular trips to CW Pencil Enterprise we visited pencil and stationery friends in Chicago and Bob Slate, a must-see spot in Boston. First we went to Chicago to see Pearl Jam at Wrigley Field and since it’s our hometown, we always have friends to see and old, new, and new-to-us places to check out. 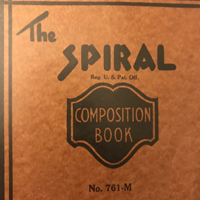 Right after our flight landed, we stopped by Greer Chicago and found a couple amazing vintage 1940s spiral bound composition books that are in perfect condition considering their age. We couldn’t coordinate our schedules to meet up with Chandra (the owner of Greer Chicago) this trip but hope to make it happen next time we’re in town! Jess was meeting a friend so I had a few hours on my own so I decided to go on a Field Notes binge. I hailed a cab and headed to the Field Museum to pick up a couple packs of the green edition and then Ubered over to FNHQ for a quick visit and to give them my money in person rather than via an online order as usual. Truly, no stationery lover’s time in Chicago would be complete without stopping by FNHQ, (or Field Notes Headquarters for the uninitiated). Next we went to Boston for a couple days to catch the Pearl Jam shows at Fenway Park. We knew ahead of time that a stop at Bob Slate was a must. I picked up a Blackwing Slate notebook and (check what pencils we got). At the second show, Jess ran into a friend who had toured the recording studio where Pearl Jam’s first album was recorded and knowing our love of pencils got us one from the studio to add to our collection. Since our time was limited and couldn’t make it to all of the National Park sites (one of our other loves) we went to Faneuil Hall to get all of the National Park stamps and some great souvenir pencils. Granted they are not vintage pencils but who can say no to a pencil with a foil embossed lobster! Come back next week when we share the story of American Linen Supply Company, the company that supplied Las Vegas hotels with their sheets and towels and washed away what stayed in Vegas.